Address: Méjico, 2, Puerto del Carmen (Lanzarote), Islas Canarias. 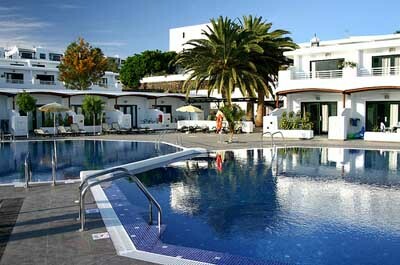 Set in the Puerto del Carmen resort, this apartment complex is set overlooking the beach. It offers outdoor pools for adults and children, surrounded by sun terraces and loungers. The attractive apartments feature a private balcony or terrace. They come with a well-equipped kitchen and a lounge area with satellite TV. Apartamentos Lanzaplaya offers a buffet restaurant, which often hosts themed dinners. Light meals are available from the poolside snack bar. Facilities at Lanzaplaya include a children’s playground, ping pong and billiards. The lounge-bar has a TV with international channels. Located in the south of Lanzarote, the resort of Puerto del Carmen has many bars, restaurants and shops. Lanzarote Airport is 10 km away. Please inform Relaxia Lanzaplaya in advance of your expected arrival time. You can use the Special Requests box when booking, or contact the property directly with the contact details provided in your confirmation. Please note that the cot is only available upon prior request and is subject to confirmation.